BRAOU Eligibility Test Registration ends on July 16, Exam on July 22: BRAOU Ambedkar Open University Second Time UG Eligibility Test 2019 Notification /Eligibility Test-2019 (Second Phase) For Admission into UG Programmes(B.A/B.Com/B.Sc.). Dr. B.R. Ambedkar Open University has issued Under Graduation Eligibility Test 2019 Notification on 28th May, 2019 and invites online applications from the eligible students for Admission into B.A./B.Com. /B.Sc Programme into their study centres for the academic year 2019-2020. 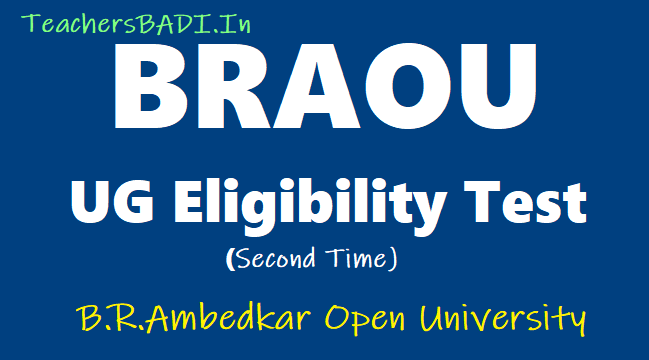 Second Time BRAOU UG Eligibility Test 2019: Dr B R Ambedkar Open University (BRAOU) would start online registrations for Eligibility Test (E.T- Second Time) - 2019 from May 28 onwards. The last date for online registration is July 16. The eligibility test would be held on July 22 from 10 am to 12:30 pm throughout the States of Telangana and Andhra Pradesh. Successful candidates would be given admission in the first year undergraduate programme (B.A/B.Com/ B.Sc) for 2019 -2020. "Eligibility Test-2019 (Second time) For Admission into UG Programmes (BA /BCom / BSc) and Last date for Registrations(online apply) is 16-07-2019". a. Application End Date: 28-03-2019 for BRAOU UG Eligibility Test 2019 First Time Entrance Exam. b. Application End Date: 16-07-2019 for BRAOU UG Eligibility Test 2019 Second Time Entrance Exam. The candidates who do not have intermediate or its equivalent qualification are eligible to appear for the BRAOU Eligibility Test for seeking admission into the first year degree programme, provided they attain the age of 18 years by July 1, 2019. Candidates who wish to register for the entrance shall register online from university portal. Candidates who do not possess Intermediate or its equivalent qualification are eligible to appear for the BRAOU Eligibility Test for seeking admission into the First year Degree Programme (B.A.,/ B.Com.,/ B.Sc.) for the Academic year 2019-2020, provided they attain the age of 18 years by July 1, 2016. Candidates who do not complete 18 years by 1st July 2019 are not eligible to appear for the Eligibility Test. Candidates who wish to appear for the E.T. shall register Online through University Portal www.braouonline.in or by debit/credit card through University Portal or by paying Rs. 310/- at AP Online Franchise Centre. The test will be conducted in English, Telugu and Urdu Medium at the Regional coordination Centres located at Adilabad, Karimnagar, Khammam, Mahabubnagar, Nalgonda, Nizamabad, Medak, Warangal, RR District and Twin Cities. E.T qualified candidates can take admission at any study centre of his/her choice in Telangana State. The Eligibility Test will be held on July 22, 2019 (Sunday) from 10:00 A.M to 12:30 P.M. The successful candidates in the Test will be given Admission into the Degree Programme for the academic year 2019-19, said Prof. A. Sudhakar, Registrar, Dr. BRAOU in a press statement. The registration procedure for ET is changed from this academic year 2019-2020 go through the guidelines suggested in the following pages and register accordingly: Please see the next pages (ET Application Format) for the information you need to provide to fill up the application on-line and keep it ready with you. 3. Fill the Application Form for ET ‘On-Line’, with the help of the operator of the AP ONLINE CENTRE. 4. Before filling the form, read it carefully and give correct information to fill the form, because the information given by you will be entered in the records of the University ‘as-it-is’ and cannot be altered under any circumstances later. 6. Select your Modern Indian Language carefully. Also fill other columns like Medium, Social Status, Area of Residence, etc. 7. If any wrong information is provided in the application form, it is the responsibility of the applicant only and the University is not liable for it. 8. See the next pages for the Code Numbers of the ET Examination Centres. Upload your latest Pass Port size (5x3.7 cm size) photograph and Signature with the help of the Franchise Centre Operator. Digital Passport sizes photos / stamp size photos are not accepted. 11. Provide your mobile number, or mobile number of your relatives / friends. (if you don’t posses a mobile phone of your own) compulsorily to enable the university to send the information through SMS to you on various activities also. Please don’t change your mobile number till the completion of the course. 12. Before clicking the ‘SUBMIT’ button, verify all the details you fill once again carefully. After submitting the form, the operator will print and give a copy of your application. Keep it for further reference. 2. The last date for Eligibility Test- 2019 Registration (Second time) of BRAOU is 28-03-2019. 2. The last date for Eligibility Test- 2019 Registration (Second time) of BRAOU is 16-07-2019. Applicants should collect Hall Tickets at least TWO days before the Examination Date from the RCC/Study Center chosen by them. Hall Tickets can also be downloaded from the University portal also (www.braou.ac.in)/www.braouonline.in. (a) ET qualified candidates can take admission at any study centre of Telangana State of his / her choice. (c) See the University portal for the list of Study Centres, A.P. OnLine Franchise Centres, Information Brochure on ET-2016 and also Model ET Question Papers.